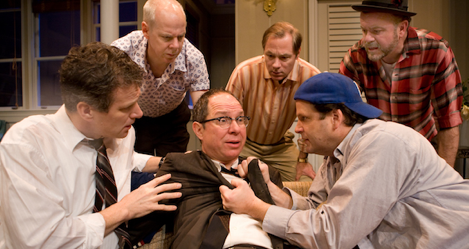 Why is a classical repertory company like Soulpepper presenting Neil Simon? He may be America’s most commercially successful playwright, but are his works on a level with Shakespeare, Molière, Beckett or Stoppard? The answer is “No” because for all his facility in writing one-liners, Simon never sets out to reshape the form of drama, to plumb depths or to challenge the audience. Despite this, his 1965 comedy The Odd Couple is a classic of popular culture for having spawned a hit film in 1968 and a popular sitcom from 1970-75. For those who need reminding, hypochondriac neat-freak Felix Ungar (Diego Matamoros) is kicked out of his house and goes to live with his divorced best friend Oscar Madison (Albert Schultz), the archetypal tank-top-wearing slob. Unsurprisingly these two polar opposites clash. Much of the humour of the play is how these two hetero men come to adopt period stereotypes of husband and wife, with Felix as the “woman” who cooks, cleans, cries and pouts. This may have seemed hilarious in the 1960s, but now that popular media have shown a much wider range of behaviours for characters gay and straight, the whole mechanism of Simon’s comedy, with its misogynist undertone, seems depressingly dated. The programme notes claim that the play is a “platonic love story,” but at no time does this idea come across in the production. What is undeniably true is that the play provides wonderful roles for Schultz and Matamoros. Schultz revels in Oscar’s extroverted slovenliness while Matamoros creates a fascinating Felix, who is more absorbed in his own mental processes than he is in the outside world. In fact, both performances are so strong they come close to expunging memories of Oscar and Felix in either the film or sitcom. The rest of the cast is uniformly excellent. Director Stuart Hughes has admirably paced Simon’s artificial dialogue where everyone is a wise guy ready with the perfect joke, put-down or snide remark. The production demonstrates that Soulpepper can expertly stage a quintessential Broadway comedy if it so desires. Let’s hope such desires remain infrequent. Photo: Kevin Bundy, Oliver Dennis, Diego Matamoros, Derek Boyes, Albert Schultz, and Michael Hanrahan. ©2008 Cylla von Tiedemann.